Bobbi Newman is a Licensed Mental Health Counselor and Certified Imago Therapist, with a Master’s degree in Marriage and Family Therapy. She is also a Life PartnerQuest Coach, empowering single people to create lives and relationships more consciously. 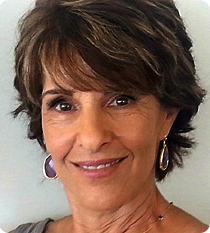 With her commitment to creating an environment in which healing and growth can occur, Bobbi has been helping individuals, children and couples in South Florida for the past 30 years. Her “soul” purpose in reaching out to clients across the country is to empower people to create loving, authentic and balanced relationships with themselves and others. Bobbi Newman is available for 3-4 hour introductory workshops about Imago for groups of four or more couples. She has taken her couples counseling national, through successful TeleCounseling. She is an inspiring public speaker and is available for any occasion.